Quinoa nori rolls with avocado cream, bright beet soup, and one totally luscious dessert. If youâre a fan of Ella Woodward, a.k.a. Deliciously Ella, good news: The sunny British blogger-slash-author has a new book out, Deliciously Ella Every Day. Here are three of her signature luscious plant-based recipes to give you a taste (sorry) of whatâs inside. Start by cooking the quinoa. Place it in a small saucepan with Â½ cup of water and the lemon juice. Bring to a boil, then reduce the heat and simmer for 10 to 15 minutes, until all the water has been absorbed and the quinoa is fluffy but not mushy. Meanwhile, chop all the veggies into thin, long strips. Now make the avocado cream. Simply scoop the avocado flesh out of its skin and into a food processor with all the other ingredients and 1 Tbsp.Â of water. Blend for a few minutes until a creamy paste forms. Once the quinoa has cooked, let it cool for a few minutes, then stir in the sesame seeds. Next assemble your rolls. The best way to do this is to lay a nori sheet on a work surface, put a layer of avocado cream in a strip on one long side, then top it with a sprinkling of quinoa and veggies. Once youâre ready, roll it up tightly. Repeat to fill and roll the other nori sheets. Either eat the rolls whole, or chop them into bite-size pieces with a sharp, preferably serrated knife. Cover and refrigerate any leftover avocado cream (press plastic wrap directly onto the surface). For a protein boost, add bean sprouts, pumpkin seeds or black beans to your roll; they all add great flavor and texture, too. Preheat the oven to 425Â°F (convection 400Â°F). Place the beet, skin on, on a baking sheet and roast for 45 minutes to 1 hour, or until there are bubbles under the skin. Meanwhile, peel the potatoes for the soup, place them in a saucepan and cover with water. Bring to a boil, then reduce the heat and simmer for about 45 minutes, until really soft. To make the croutons, chop the potatoes (no need to peel) into small, bite-size pieces and place them on a baking sheet with lots of olive oil plus the chili flakes, salt and pepper. Bake for 45 minutes, until crispy outside and tender within. When the beet is cool enough to handle, peel. Chop it in half and place it in a blender. 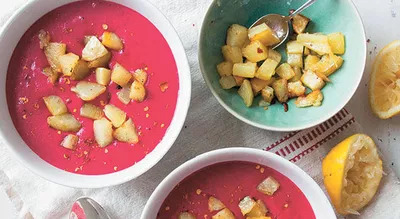 Drain the boiled (soup) potatoes and add them to the blender with the lemon juice, chili flakes, cumin, garlic, coriander, and coconut milk, plus some salt and pepper. Blend until smooth; if you find itâs too thick, add water until you reach your desired consistency. Place in a saucepan and heat it up to the perfect temperature. Pour into a bowl and sprinkle with the roast potato croutons. Save time by using a ready-cooked beet. Just be sure to check there arenât any additives in it. 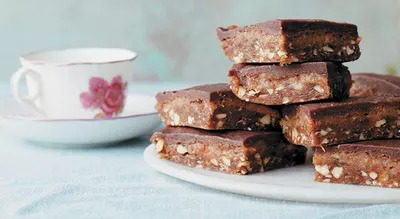 Start by making the base: simply put the almonds and pecans in a food processor and blend for about 1 minute until a grainy flour forms, then add the dates and almond butter and blend again until the mixture becomes nice and sticky. Transfer the mixture to the bottom of a baking pan lined with parchment paper (mine is 12 x 8 x 2 inches), pushing it down firmly with a spatula. Place the pan in the freezer for 20 minutes. Next make the caramel layer. To do this simply put all the ingredients into the food processor with Â½ cup of water and blend until smooth and creamy, then pour onto the base layer and put the pan back into the freezer for 30 to 40 minutes, so it becomes firm enough to pour on the chocolate layer. Finally make the chocolate layer. Place the cacao butter and the almond butter in a saucepan and melt on a low heat. Once theyâve melted, pour into the food processor with the remaining ingredients and blend until smooth. After the caramel has become solid, spread the chocolate layer on top, then place the pan back into the freezer for about 2 hours. Take them out and leave at room temperature for 15 to 20 minutes, to let them warm up a little, then cut them into 16 slices to serve. Since some ingredients are repeated within this recipe, hereâs a condensed list to take to the store.